"Davis is one of the fastest learners I know, absorbing dance moves and techniques into his body like a sponge. Who do you know who can learn to solve a rubik's cube while navigating Boston traffic, huh! ?” –Bronwyn Bryant, Providence, RI, Lindy Hop instructor. Davis was born in Nashua (Nash Angeles as some residents like to call it), a mid-sized town on the central, southern border of NH. It seems as though all of his experiences in life have led him to Lindy Hop. He grew up playing all types of sports and continued his athletics in high school and college: a tri-varsity athlete (football, basketball, baseball) at Phillips Academy Andover, a Boston College cheerleader. The son of a musician, Davis has been playing guitar since the age of 9, bass since the age of 15, and has a background in piano, drums, and voice. As a double major in Psychology and Music at BC, he also studied professional audio recording and worked in the Audio Visual Department cutting and editing all of the music for the Dance Ensembles performances. Since 2004, Davis has submerged himself in the study of Lindy Hop - the oldest authentic American partner dance, which evolved out of Harlem's Big Band Swing Era. 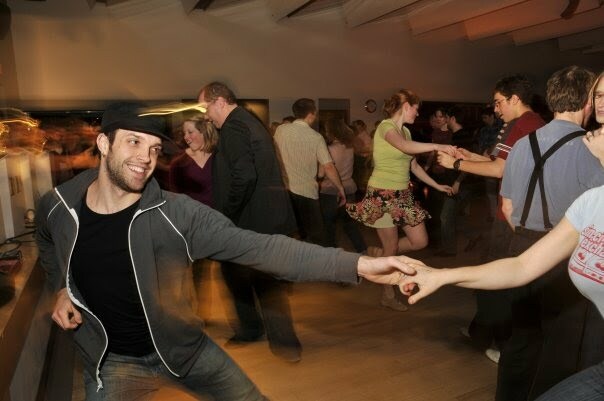 He had studied a little East Coast swing as early as 2000, but since taking the plunge into the Boston dance scene, Davis has picked up other forms of dance including Charleston, Balboa, Blues, West Coast Swing, Hip Hop and Salsa. Davis is now a full time dance instructor living in Pittsburgh, PA, but he travels frequently so make sure keep checking his calendar to see where he will be next. For private dance lessons - Contact Davis Here.